After wearing myself out publishing an interview a day for last year’s #WomensHistoryReads series, which ended up continuing for a full month after Women’s History Month was over, this year I cut way back. Only for March, I said. And only for novelists. Well, I’ll be breaking both of those rules, as it turns out. But hey, women throughout history have had to break rules to get things done, right? Right. A little peek behind the curtain: I offer my interviewees about 10 questions and they choose 3, and it’s always fascinating to see what gets chosen. Of most interest, of course, are the answers! On to Jen’s. Jen: This is the first question that jumped out at me from the list. It’s been a bigger question for me than I would have expected. A few months ago, I was having lunch with Jaclyn Friedman (who wrote the amazing Unscrewed), and she was giving me a hard time for not calling myself a historian. She was incredulous that I was writing a book on history, and yet wouldn’t give myself the title. Maybe it’s living in such an academic town that makes me so reluctant. It seems like the title “historian” is something you earn with a degree. I did briefly pursue a masters degree in Public History at Northeastern, but I couldn’t afford it. I realized I could do the projects I wanted to do without spending thousands of dollars that I didn’t have. Still, I’m grateful for the semester I had there. I took a theory and methodology class, and that’s been helpful in my work. My fellow students were also great, and I was thrilled to meet them and have amazing conversations with them once a week. It was a terrific break from hanging out with a toddler, which was my main occupation then, and teaching intro to computers classes, which was my other occupation. Now that I have a book that is officially classified as a history book, I’m revisiting the word. I suppose I can call myself a historian now, but I have to ease into it. Greer: I’ll call you a historian, if that helps! (I added it to the introduction as soon as I saw this.) Next question: What’s the last book that blew you away? Jen: The Library Book by Susan Orlean. She goes so deep in it, while also telling the history in such a compelling way. Her writing always makes me feel like I am walking along next to her as she takes me through the narrative. I love her confidence in describing the fire as if she witnessed it herself. It’s an amazing accomplishment. It was particularly compelling to read it while I was waiting for my own book to be published. It’s powerful to think of something I created contributing to the conversation she describes. Greer: What’s your next book about and when will we see it?/Tell us about a woman from the past who has inspired your writing. Jen: I’m smooshing these questions together because they’re connected for me. Back when I was in my twenties, I was hanging out with my Grandma, who was born in 1908, and very cockily said that when I got married, of COURSE I would marry someone who did half the housework. She replied, “that’s what we thought.” It blew my mind. My grandmother was no radical feminist. She would get very upset if she was called Mrs. Rosalind Deaderick in formal correspondence instead of Mrs. Alfred V. Deaderick. She counseled me not to wear sneakers too often, to keep my feet from “spreading.” She never wore pants. Still, the feminist wave that led up to the passage of the 19th amendment, and the changes in gender roles that followed, had impacted her. She’d grown up in the Bronx, which gave her a proximity to the massive changes happening. That exchange, and other chats with her, made me realize how complicated the history of women’s rights was, and helped inspire me to eventually write this book. Grandma was also the person who got me interested in genealogy and how it connected us personally with history and the passage of time in general. I very clearly remember another day with her, later in my 20s, when we sat and looked through photo albums together. She told me stories about these family members that were long gone, and as she did, I realized I was going though some of the same experiences they had, and was asking some of the same questions about my life. It gave me a perspective that I hadn’t had before, and made me clearly realize that all of the past had only happened through a series of choices made within a context over which we often had very little control. No one knows how anything will turn out, we just keep going, and that’s always been true. My grandfather was from a prominent Southern family, and my Yankee grandma had needed to learn their history to get in good with his kin. At some point in my late teens or early twenties, I was given the family history that had been passed down since my distant cousin, Anna Mary Moon, had written it around 1933. It’s really racist, and speaks very casually about the slaves my ancestors owned, and the Native Americans they killed. My mother was given a copy when she married my Dad, and has never recovered from the horror she felt while reading it. As an actual descendant, I’ve had to really wrestle with what this family history means to me. In my next book, I want to talk about that history, and the long tradition of women passing along family history, often building glorious myths about their male ancestors along the way. 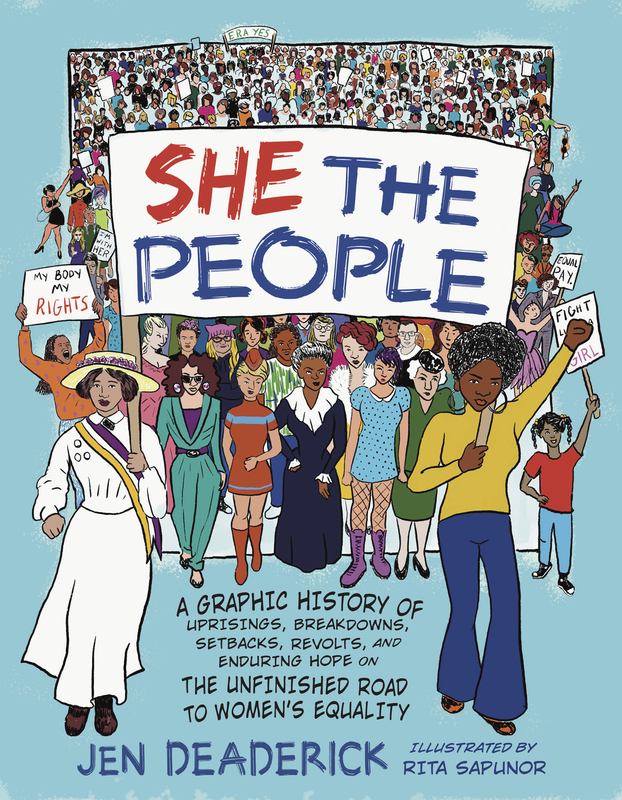 In SHE THE PEOPLE, I talk about the central role of the United Daughters of the Confederacy in passing along the Lost Cause myth, and I want to expand on that, and weave in my own family history along the way. I see the book as a response to Anna Mary Moon’s. Greer: Sounds fantastic. Can’t wait. Jen: My question for you: Regarding the role so many women have played in helping to create male myths, both through genealogy and published scholarly works, is there a greater obligation on female historians to tell women’s stories? Additionally, how do our experiences as women impact the ways in which we tell men’s stories, if they do? Greer: Ooh, that is a BIG question. I will try to appropriately size my answer. I think we should write what moves us. The appetite of the historian, or the historical novelist, to dig deep and write hard on a story that she’s passionate about — that strikes me as the most important thing, right off. That said, I’m sure there are people out there writing all sorts of horribly racist, misogynistic, offensive stories — including these faux-glorious male myths — who would defend those stories with plenty of passion. (They would also probably argue that they’re “just telling the truth,” as if “truth” and “something someone wrote down once” were synonymous.) There will always be women who want to tell men’s stories and men who want to tell women’s stories, and I’m not one to draw a hard line and say that can’t be done beautifully. But there is no getting around the fact that men’s history tends to be overdocumented and overexplored, and women’s history tends to be underdocumented and underexplored. So in that way, yes, I think responsible historians should lean toward women’s stories and the stories of underrepresented groups of any gender. We don’t need more George Washington on America’s collective bookshelf. Find and tell the stories we don’t know by heart. I want the names Kate Warne, Irena Sendler and Ida B. Wells to be as familiar as John Wilkes Booth, Oskar Schindler and W.E.B. DuBois. And it’s not as if introducing these lesser-known names replaces the better-known ones: there is so much capacity to make history bigger. Add Sophie Scholl alongside Anne Frank, Claudette Colvin alongside Rosa Parks, Elizabeth Bisland alongside Nellie Bly. That’s what I want to see.